What Can You Put On Your Commercial Flat Roof? What Can You Put On Your Flat Roof? 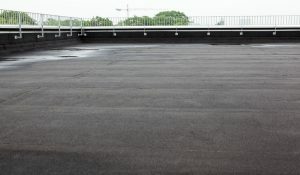 Flat Roofing Needs Extra Protection From Water Damage. Flat roofs are more prone to damage because there is no slope to the roof. That means that when things like rain happens, water will puddle up because there is nowhere for it to slide off of. Other roofs have a slope or even a slight slope that will allow water to run right off and not gather up on top of the roof. This also leaves these types of roofs wide open to roof repair, mold growth, and leaking to happen inside of the building. With many amazing roofing options out there right now, it is easy to avoid this kind of problem and have peace of mind that your roof is safe from harm. TPO – TPO roofing is a great choice that you can put on your roof to make sure that is stays protected and free from things like water damage and other deep damage that can happen on other roofs. Metal – A metal roof is popular to put on commercial buildings because of the longevity and the strength that metal tends to have. These roofs offer unbeatable protection. Single Ply – Single ply roofs are typically less expensive and they can be installed pretty quickly as well. They protect from water damage and often times will last around 20 years or even longer. Roof Coating – If you already have a roof on your commercial building, but you want to keep it extra protected from things like water,m this is a great option. When you want a new roof for your commercial building in Texarkana, TX, call R.B.T Construction Roofing Division at 903-691-0931 and we will be able to go over the options with you. Posted in Uncategorized on September 24, 2018 at 11:15 am by R.B.T. Construction Roofing Division.